This paper is a result of collaboration with researchers at the University of Glasgow who I met while interviewing for a position. I didn’t get the job, but I did get talking to Paula Lindgren and we discovered a common interest in using Raman Spectroscopy to study organic carbon. This publication is the first result of that, and is available as an open-access article. The paper is a comprehensive study of a meteorite collected from Antarctica. Antarctica is a great place to find meteorites because they sit on top of the ice and are easy to spot – sometimes the flow of ice even concentrates them into particular areas to makes things even easier. This meteorite is classified as a “CM carbonaceous chondrite” and has experienced very little change since it was part of the protoplanetary disc billions of years ago. Therefore we can use it like a time capsule to look at what the early solar system was like. However, some meteorites are better time capsules than others. As they float around the solar system, they can build up ice, which can then be melted by radioactivity and the water released can alter the crystallography of the meteorite. 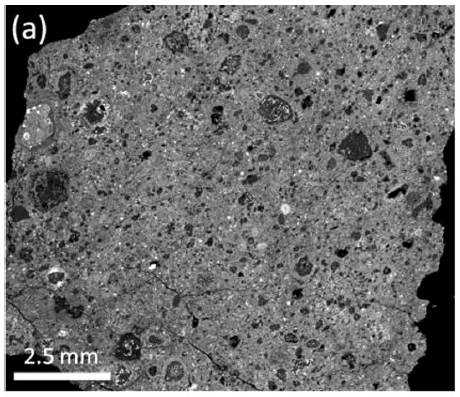 Our paper uses a wide range of techniques to characterise the meteorite and show that it is one of the least altered carbonaceous chondrites ever found. The techniques used included electron microscopy (both scanning and transmission techniques; SEM and TEM), X-ray analysis, X-ray diffraction, thermogravimetric analysis (TGA), oxygen isotope measurements and Raman Spectroscopy. My contribution was to use my automatic Raman processing technique to determine how crystallised the carbon in this meteorite was in comparison to carbon in other meteorites.